First Line from Introduction: In 2006, the census bureau reported that Phoenix had overtaken Philadelphia to become the nation's fifth most populous city. 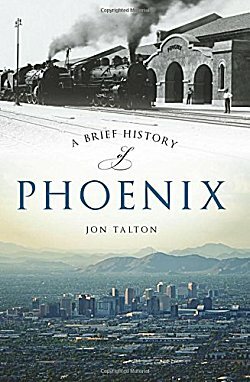 In this information-packed little volume, Jon Talton proves that those who say Phoenix has no history don't know what they're talking about. The land Phoenix is built on was once occupied by the most advanced pre-Columbian irrigation society. In 1950, it ranked 99th on the list of the largest cities in the United States. Today it is number six. It takes some history for a hot little desert town to shoot up the charts like that, and fourth-generation Arizonan Talton knows where the tastiest bones are buried. From how its first white settlers turned Phoenix into an agricultural mecca to visits from such "luminaries" as Al Capone to when the bubble burst in 2007, this is a balanced account of Phoenix's history. Talton tells it in such a manner that I wish the book was ten times longer, but at least his bibliography has plenty of sources so that I can learn more. In many ways, this is the perfect accompaniment to the author's David Mapstone mysteries. In those Talton shares tantalizing bits of Phoenix history, so reading this was definitely a pleasurable learning experience. Oh, now this sounds interesting, Cathy!! I do love the rich history of the Southwest, and this sounds like a really good treatment of it. I can see why you liked it so much. As I said in the review, Talton makes this so interesting, I wish the book were much much longer!